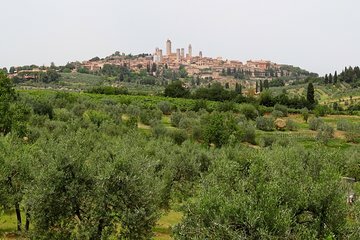 Visita dos de las ciudades más pintorescas de la Toscana y prueba el auténtico vino Chianti en esta excursión privada de un día desde Florencia. Viaje a través de un paisaje de colinas, olivares y antiguas villas en el camino a Siena, conocida por su extraordinaria catedral y la famosa carrera de caballos Palio. Después de un delicioso almuerzo toscano y una degustación de vinos en una finca cuidadosamente seleccionada, continúe hasta el pueblo medieval de San Gimignano, en la cima de la colina, donde más de una docena de torres supervivientes se alzan sobre el hermoso paisaje de abajo. Experimenta la belleza y el sabor de la campiña toscana. Our driver was very punctual ( showed up at 15 minutes early and called to inform us he was ready at our leisure ) During the drive he was knowledgeable about the places we we going. The vehicle was clean and comfortable ( I am 6’5” tall and it was a relief ) The winery ( Tenuta Torciano ) was incredible ( has helicopter pad for private helicopter tour ) the staff which is all family were gracious and very friendly. The tasting course was fantastic. I would have loved to spend more of the day here learning about the wine and food. I totally recommend this tour. It will ensure you get enough of each location to appreciate all they offer. We enjoyed the wine tasting and lunch and loved the vineyard!A little disappointed that our driver spoke almost no English after we specifically requested an English speaking guide.So it was literally a driver. But we enjoyed the day.